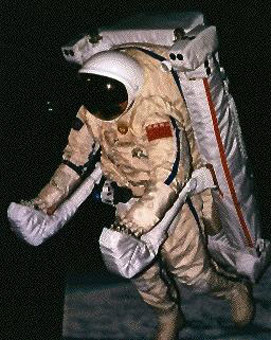 A manned maneuvering unit (MMU) is a one man rocket powered backpack that is used in space since the US space shuttle missions. The concept was developed much earlier in the mid 1960's. 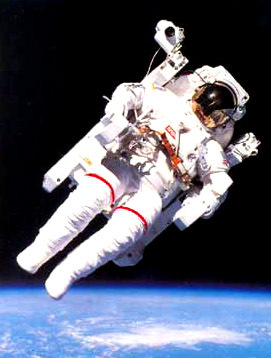 In space MMUs allow the astronaut to operate away from the spacecraft untethered. On earth those unit are usually just called jetpacks and if you are old enough to remember the opening ceremony of 1984 Olympic games in Los Angeles,you will know what I'm talking about. If not this link will help you visualize what happend then. MMUs where also used by the Sowjet space program. The big advantage of MMUs is the great maneuvering flexibility in space and on earth. One big disadvantage on earth is the very limited flying time the jetpack delivers as onboard fuel is limited. If more flying time could be achived, it would be the ideal transport vehicle for everyday activities. Recently a similar idea has been taking to the extreme as you can see in this video. As many of us think the idea of a manned maneuvering unit is something new, I believe similar technology was used by the "gods" in antiquity. 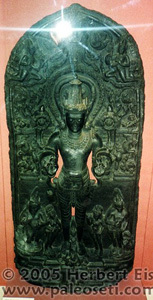 Ancient Indian stele (see my photo examples from the British Museum in London below) show a curious similarity between the ancient stele and modern MMUs. 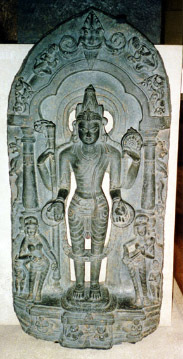 Now we can look at the above stele from the front (left photo). You can clearly see that the Indian god/godess is depicted with four arms. The comparison shot with the US MMU on the right. Can you see why the ancient artists where confused because they never seen anything technical before? It really looks like the Astronaut has four arms if you don't know what your are looking at. If you scroll further down on the page you can see the same effect on simpler MMU that was used on Earth without the spacesuit. The exhaust on both sides of the unit also looks like the person has four arms if you see it from far away and you don't know what it is. Man beachte, dass bei dieser Darstellung die Beine der Gottheit regelrecht "festgeschnallt" sind. Bei modernen Piloten macht man das wegen der hohen Beschleunigungs-kraefte. Wurde die Antike MMU auch in der Atmosphaere benutzt? If you look closely you will see that the legs of the god are fastened with a safety belt. With modern pilots this is done because of the high g-forces during acceleration and banking. Another intersting aspect are the many tools the MMU has onboard like the camera. For somebody completely without any technical knowledge those might be interpreted as an eye. Other powertools that move by themself must appear magical to somebody without technical background. Could it be that powertoolols would be depicted as "little helpers"? Afterall there must be a little person in them to make them work. I think this is exactly what we see on the ancient stele on the left. 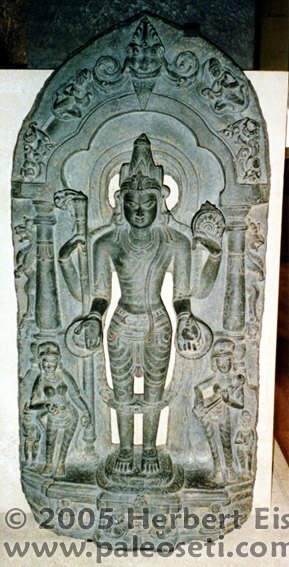 Here another example of a "MMU stele" to show that the above is not just a single case. 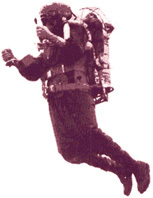 Below you can see an example of a Jetpack as it is used for flights inside the atmosphere.